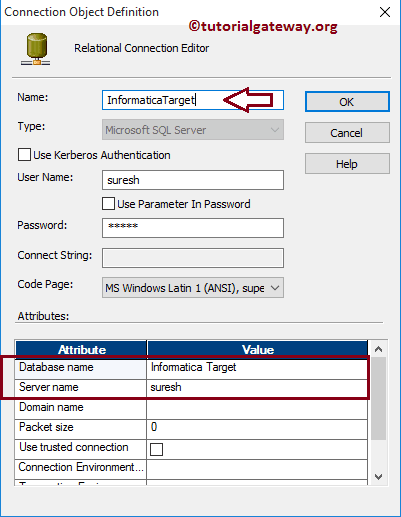 A Session in Informatica is a set of instructions that tells the Informatica Integration Service when and how to move data from source to target. Non-reusable Session Task: Session Task that we created in Workflow Designer is non-reusable. 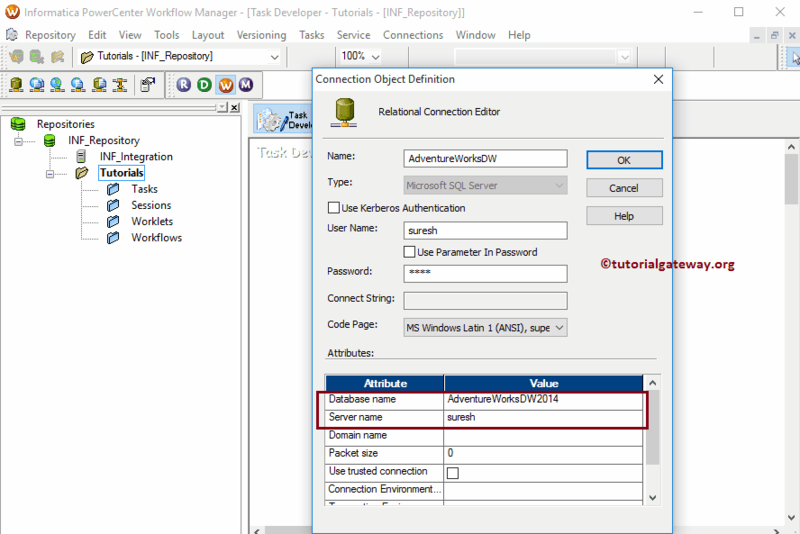 NOTE: Before you create a Non-reusable Session in Informatica, we must configure the Workflow manager to communicate with databases and Integration services. Step 1: Configuring the Source and Destination connection. 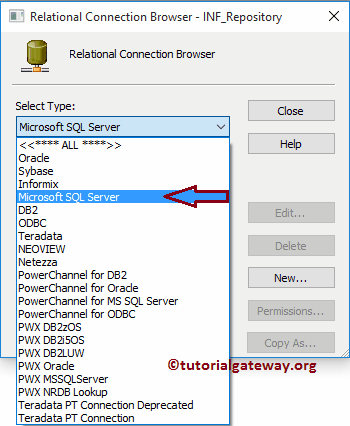 In this example, we are a connection to SQL Server Relational Database. 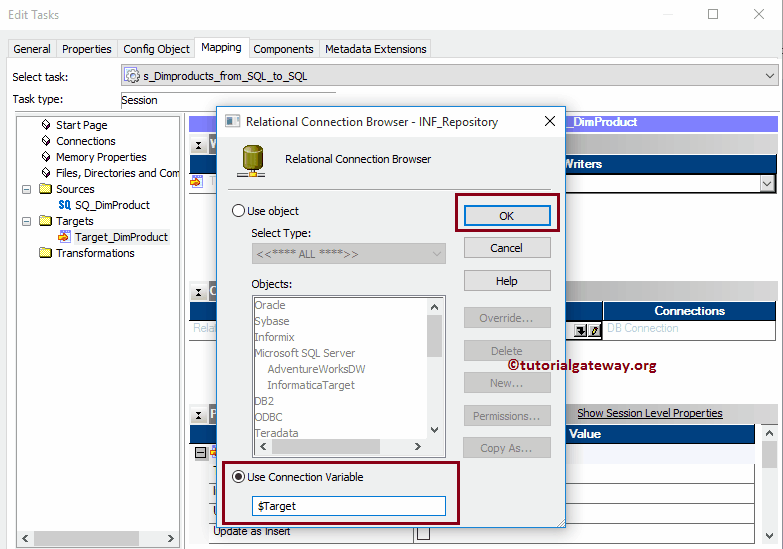 First, connect to the Informatica repository service. In order to connect with Repository service we have to provide the Informatica Admin Console credentials so, Please provide the appropriate Username and Password and click on Connect button as shown below. From the below screenshot you can observe that we are in the Task Developer. 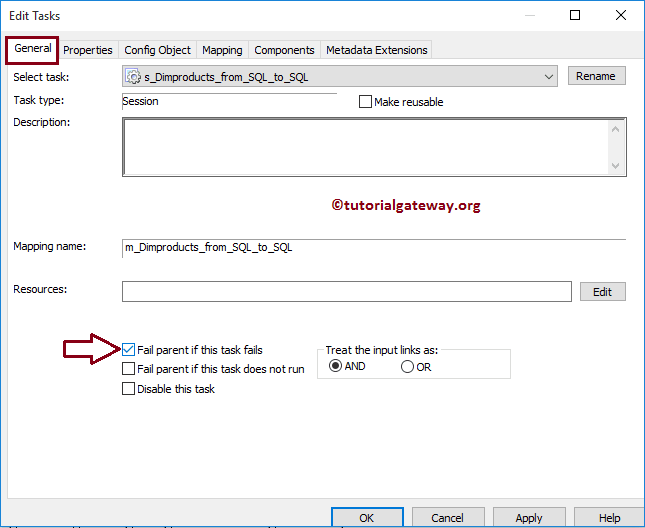 Before we start creating Session in Informatica we have to configure the relational database connections. In order to do this, Please navigate to Connections Menu and select the Relational option as shown below. 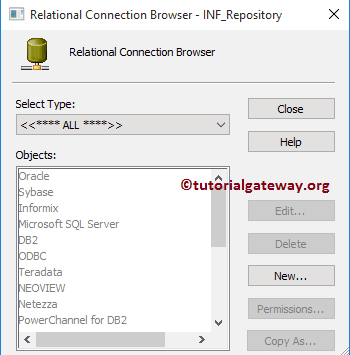 Once you select on the Relational option, a new window called Relational Connection Browser will be opened as shown below. 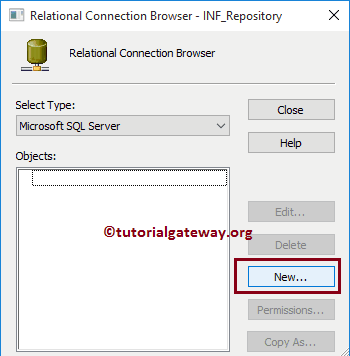 This will help us to create a connection to our relational database. From the below screenshot you can observe that currently, we don’t have any relational connections. In order to create a new one, please click on the New button as we shown below. 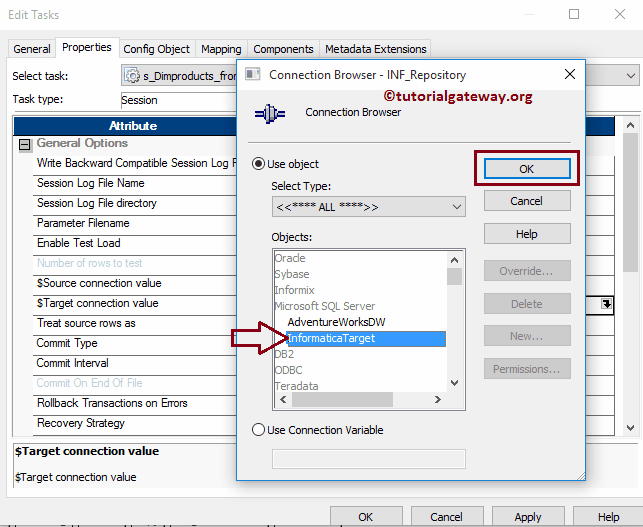 Once you click on the New button, a new window called Connection Object Definition will be opened as shown below. Name: Please specify the unique name for this connection. Username: You have to specify the username to connect with database. Password: Here you have to provide the password of the above-mentioned user. Database Name: Please specify the name of a database you are going to use. 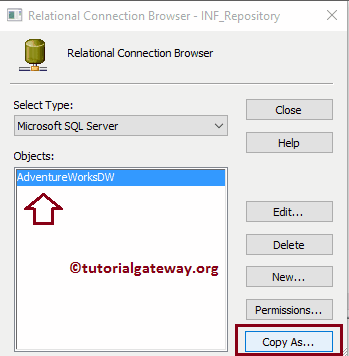 For this example, we are using AdventureWorksDW2014. Server name: Here you have to write your server instance name. We need to create one more connection string for our target database. Although we can create using the above-mentioned steps we want to copy the above connection using the Copy As.. option. 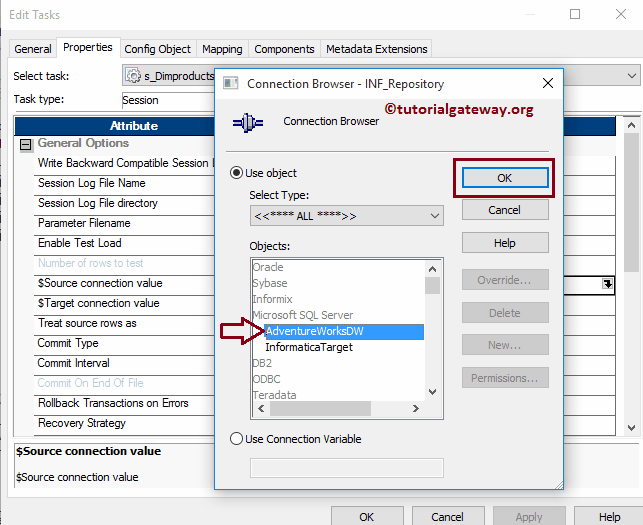 This will open the connection Object definition window for the target so, please specify the connection name, database name and the remaining details. 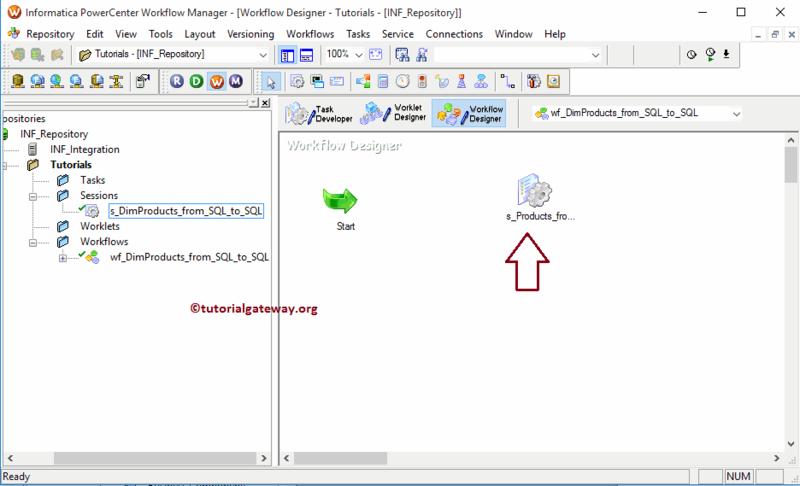 NOTE: Once we configured the database connections, we have to create a workflow within the workflow manager. We will explain this in our next article. In order to create Non-reusable Session in Informatica, Please navigate to Tasks Menu and select the Create option as shown below. Once you click on the Create button, a new window called Mappings will be opened. Here we have to select the mapping you want to associate with this session. From the below screenshot you can observe that currently, we have only one mapping so we are selecting it. 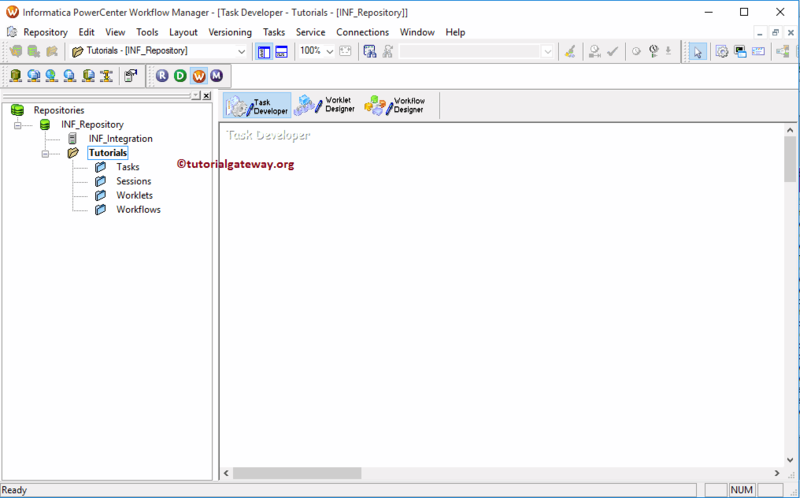 Double click on the Session task will open the following window. Within the General Tab, we can rename the Session Task to a more meaningful name. Please do not forget to provide a valid description of the Task. Fail Parent if this task fails: Please check mark this option. if this session task fails then it will fail the workflow. Within Properties Tab, we have three common properties that we have to configure for the relational databases. $Source connection value: This property will store the relational source information in $Source variable. So, we have to configure the source connection by clicking on the Arrow we marked below. TIP: If you want to create a new connection before then, you can use the New button. $Target connection value: This property will store the relational target information in $Target variable. So, we have to configure the target connection by clicking on the Arrow we marked below. 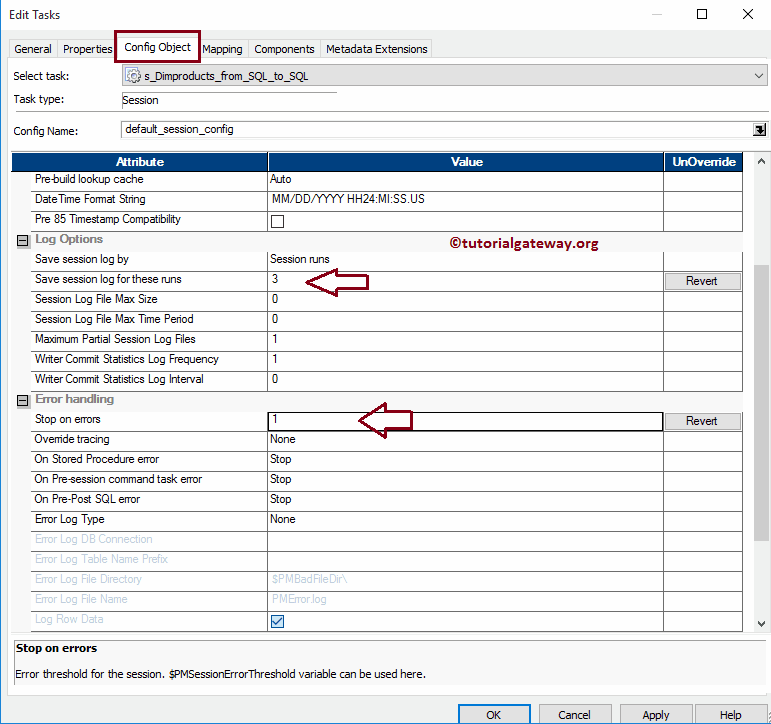 Write backward Compatible Session Log File: If you check mark this option then, Informatica will generate the session file in text format so that we can review it later otherwise, it will generate only binary format. 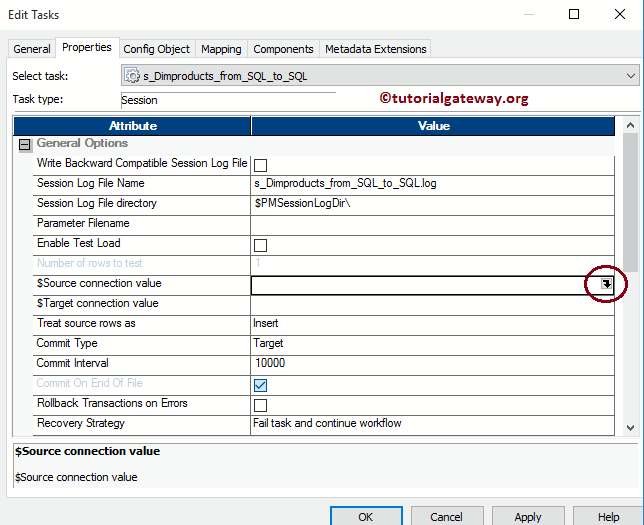 Within the Config Object, we have to configure the Log options and Error handling. Although we have many properties, we are discussing and configuring the most common properties within this window. Stop on Errors: Please specify, how many errors you want the session to tolerate. For example, if you specify 3 then the session will run until it encounters three errors. 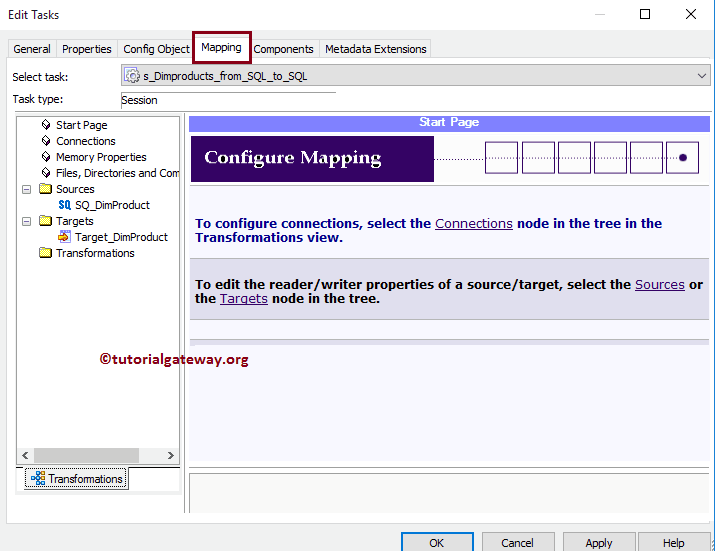 Within the mappings tab, we have to configure the Source, target Connections and some common properties. 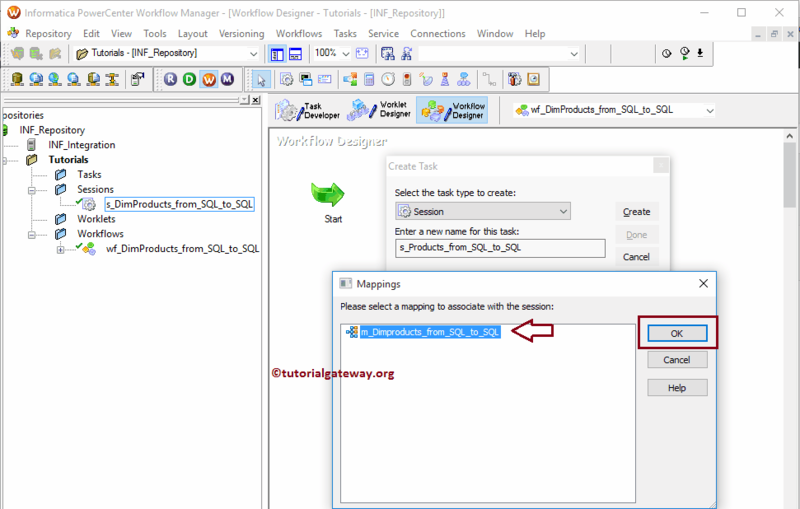 First, let us configure the source connections by clicking on the Dimproducts source present in the Sources folder. 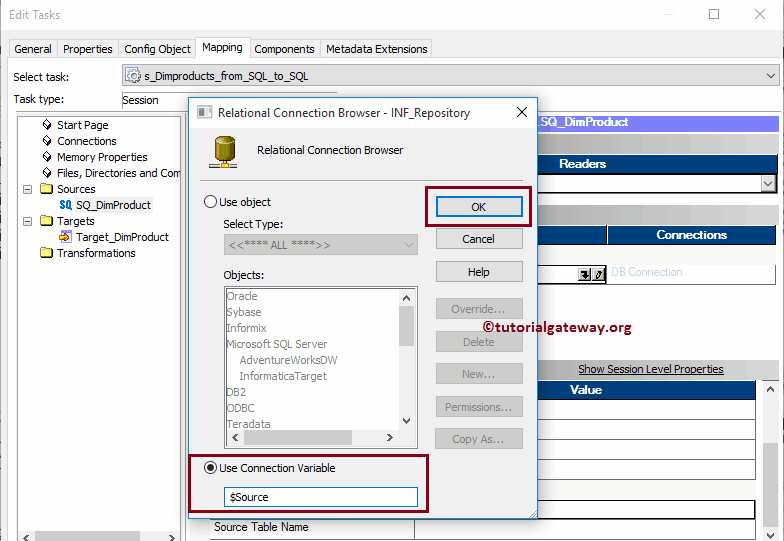 Within the Connections, select the Arrow button beside the relational type to open the Relational Connection Browser as shown below. 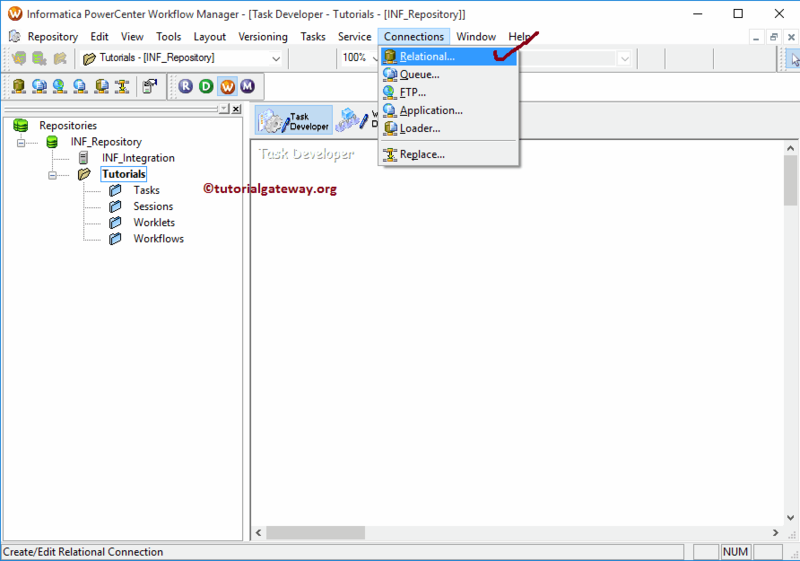 This window will help you to configure the source connections (creating new, modifying etc). 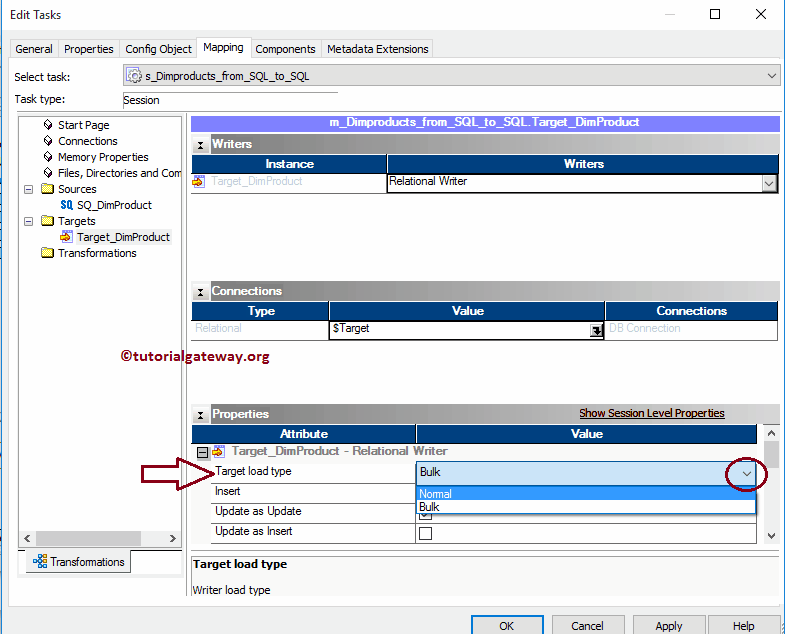 Now, let us configure the target connections by clicking on the Target_Dimproducts present in the Targets folder. 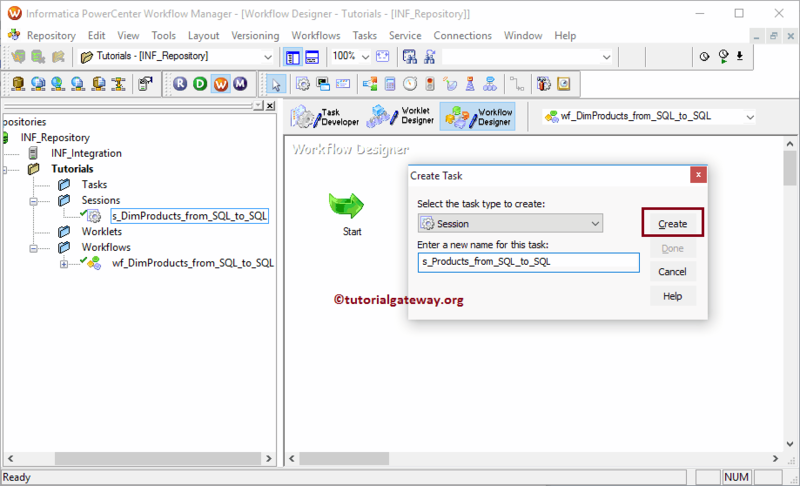 TIP: You can also select the Use Object option and select the Database name also. Target Load Type: If your target table has indexes then use the Normal type otherwise, Bulk type. Remember, the bulk type will insert the data faster than Normal but it does not work on indexed tables. 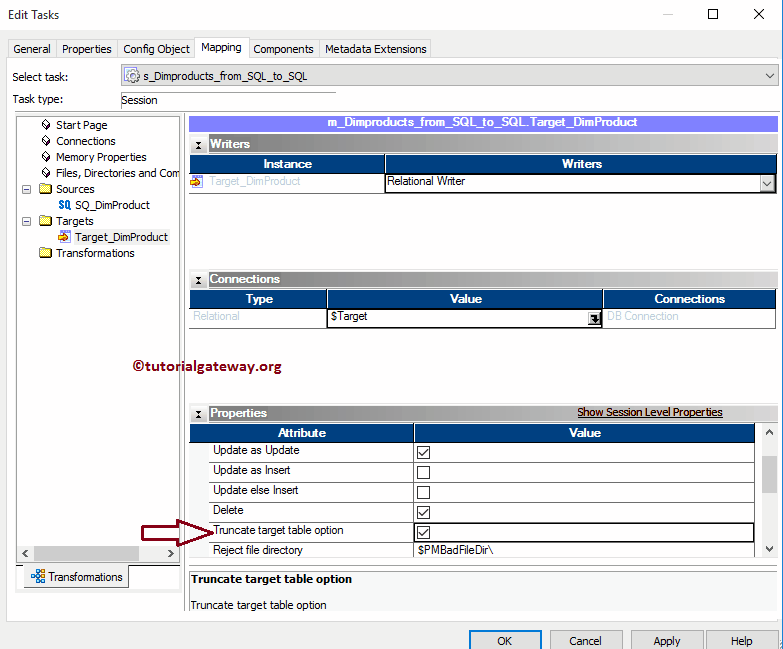 Truncate target table option: By check marking this option will truncate the existing data from the destination table. This will help us to insert fresh data for every successful run. 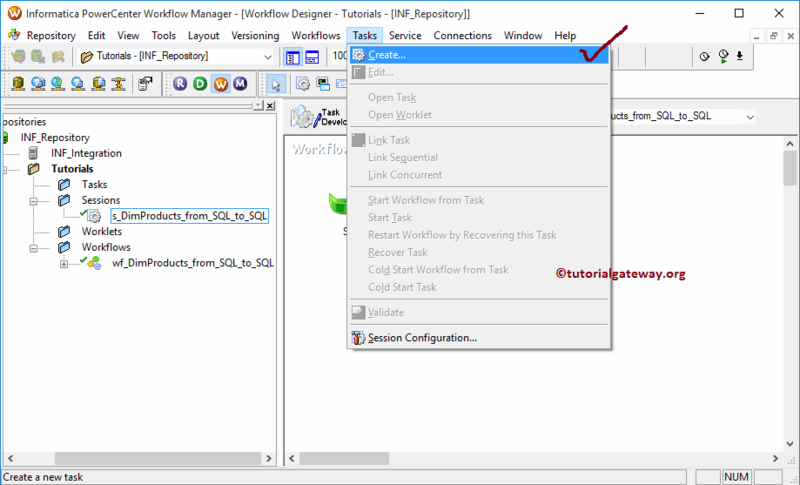 Once you finished creating the Informatica session task, we have to Link the workflow with the Session Task.